Physical Education is a compulsory subject in the curriculum from KG to Grade 9 and optional for higher grades. It is designed to meet the needs of all students, promoting physical activity and health as well as gross motor skills, teamwork and competition. A child may be granted an exemption from PE on the written notification of a registered physician that is presented at school. 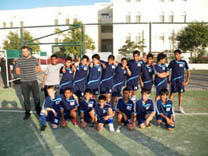 In addition, students are encouraged to join sports clubs organised and lead by members of the PE Department. Students participate in intra-school and inter-school tournaments and competitions. The school also organizes field days. The school has sports facilities that include a gym and outdoor courts. © 2010 International School of Oman. All Rights Reserved. Powered By TRANSOFT.